Bad weather is being blamed as the probable cause of a plane crash in Indonesia on Tuesday which left at least 25 people dead. An MD-82 passenger plane belonging to budget airline Lion Air skidded off the runway in heavy rain and crashed into a nearby cemetery in Solo, central Java. A spokesman for the airline said the plane had been hit by a strong tail wind as it landed. It was the most deadly plane accident in Indonesia in several years. The plane had flown from Jakarta with at least 140 passengers and seven crew on board. The pilot, two flight attendants and a mechanic were reported to be among the dead. About 40 people were reported injured. Survivors told local television about their ordeal. "People were screaming Allahu Akbar! (God is great) when it skidded off the runway. It finally came to a halt after hitting a graveyard next to the runway," one man said. 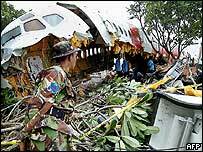 Indonesia's worst air disaster took place in 1997, when a Garuda Indonesia Airbus crashed on the island of Sumatra in poor visibility, killing all 234 people on board.